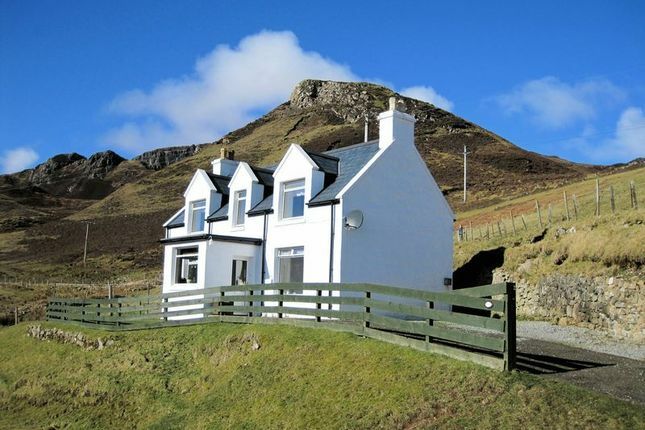 Re/max Skye is delighted to present to the market, Half of 1 Digg, a traditional detached cottage, rurally situated in an imposing, elevated position at the base of the Trotternish Ridge in the north east of Skye with stunning views to the Minch and over towards the hills of Applecross on the mainland. With 3 double bedrooms, garden and outbuilding, this charming property would make an idyllic holiday or family home, so call us to arrange your viewing appointment on . location: The Trotternish Peninsula in the north of Skye is undoubtedly one of the most spectacular parts of the island. The Trotternish Ridge dominates the landscape and offers some of the best hillwalking and views around, from the Quiraing in the north to the Old Man of Storr further south. Here you will find the buzzards, falcons and golden eagles that make this part of the country their home. Local amenities can be found in the village of Staffin, approx. 1 miles south, including primary school offering English and Gaelic medium, grocery shop with petrol pumps, community centre with shop, hotel and cafe. There is also a pretty beach and slipway in Staffin. Portree, the island's capital, is approximately 18 miles south. Accommodation: ½ of 1 Digg was built in approximately 1945 and now benefits from double glazing and Multi-fuel stove in the lounge. The property has a private water supply and is in a Broadband enabled area. UPVC exterior door, windows to front and side elevations with far reaching views, tiled floor, wood effect paneling to walls, door to hallway. Hallway: Fitted carpet, built-in storage cupboard, access to ground floor accommodation. Window to front elevation, fitted carpet, TV point. Fireplace with multifuel stove, tiled hearth and wooden surround. Door to kitchen. Window to rear elevation, vinyl flooring. Range of wall and base units with work top over. Stainless steel sink with drainer. Electric oven, gas hob, plumbed for washing machine. Space for table and chairs. Window to rear elevation, vinyl flooring. Fitted base units with work top over, glass fronted display cabinet. Door to rear garden. Bath, WC, pedestal wash hand basin, walk-in shower with hand rails and seat, tiled walls, vinyl flooring, electric wall heater. Window to front elevation with panoramic views, fitted carpet. Upper floor landing: Landing with balustrade, fitted carpet, doors to 2 bedrooms and boxroom, wood effect paneling to walls. Window to front elevation with panoramic views, fitted carpet. Built-in cupboard. garden: The garden is mainly under grass. There is ranch-style fencing to the front and stock fencing to the rear. Services: Mains electricity, private water supply, drainage to septic tank. entry: At a date to be mutually agreed. offers: Should be submitted in proper legal Scottish form to re/max Skye Estate Agents, Main Street, Broadford, Isle of Skye, IV49 9AB. Fax no. interest: It is important that your solicitor notifies this office of your interest, otherwise the property may be sold without your knowledge. important information: These particulars are prepared on the basis of information provided by our clients. We have not tested the electrical system or any electrical appliances, nor where applicable, any central heating system. All sizes are recorded by electronic tape measurement to give an indicative, approximate size only. Prospective purchasers should make their own enquiries - no warranty is given or implied. This schedule is not intended to, and does not form any contract.